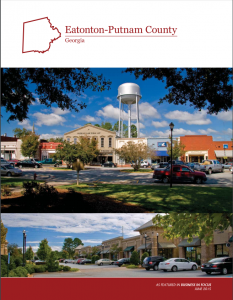 Central Georgia Technical College’s (CGTC) Putnam County Center and Economic Development Division have crafted a customized course in response to the construction workforce needs of Putnam County. Beginning February 26, 2018, the Center will offer the Basic Construction Craft Laborer Skills, a four-week course delivered each Monday, Tuesday and Thursday from 6 to 8 p.m. The cost of the course is $475 per participant, but qualified applicants may take the course free of charge through Work Source Georgia grant funding. (From the left) Terry Schwindler, Carrie Dietrich, and instructor, David Dixon are three of the many individuals who have worked to bring the Putnam County community a basic construction continuing education course. Involved in the collaboration were Work Source Georgia of the Middle Georgia Consortium (WSGMGC), Putnam Development Authority (PDA), and CGTC. Terry Schwindler, the economic development director for the Putnam County Development Authority, described this collaboration as a response to business concerns for skills needs. The course is designed to provide recognized credentials that lead to employment in the construction industry. The course will also introduce the student to employment skills that will help them obtain and maintain employment within the construction fields. Ann Lear, CGTC’s director of Business and Industry Training developed the course which includes specific topics such as construction math, hand tools, and blueprint reading.